Most existing makeup compacts contain pre-sorted colors and makeup combinations, limiting your ability to customize palettes to best suit your unique needs. Glam-it!™ is here to change the way you make up with GlamPact™, the first and revolutionary light up all-in-one beauty compact that fits in the palm of your hand. With its LED lined mirror that can be switched on and off, enabling touch ups anywhere, GlamPact™ outshines existing compacts and makeup organizers by offering unparalleled convenience, functionality and customization. GlamPact™ makeup contains potent moisturizing and anti-aging clinical skincare ingredients and botanical extracts, to make you look and feel great inside and out! 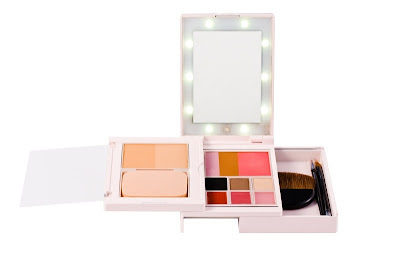 With GlamPact™’s refill system and a growing collection of makeup including pressed CC powder, blush/bronzer/highlighter, eyeshadows, and lip rouges, you can easily select and “snap in” new refills, colors, and looks. GlamPact™ includes basic makeup brushes and tools, and a USB cable to recharge your mirror, allowing you to glam up anytime, anywhere! GlamPact compact available in Pink and Black. Available in Black or Light Pink on Glam-it.com/GlamPact and Glam-it!™ flagship store (1/F, 9 Humphreys Ave, Tsim Sha Tsui, Hong Kong).